Matunda Nyanchama, Ph.D., CISSP is a Principal and Director at Agano Consulting (K) Ltd., where he provides strategic direction and consulting. Matunda has more than 20 years’ experience in Information Communication Technologies (ICT) and more than 14 years in Information Security. He has held several senior positions in various industries, including IBM Global Services, Financial Services, Big 4 and Academia. He was the Senior Manager in charge of the information protection centre and security operations at Bank of Montreal, Canada. He later worked as the Senior Manager of Information Security and Risk Management at Moneris Solutions before joining IBM Canada as the National Delivery Leader for Information Security, Privacy and Identity Management. Dr Nyanchama previously worked at the defunct Kenya Posts and Telecommunications Corporation (KPTC) where he served in various telecommunications divisions including switching, radio and frequency management. He served in various areas in the corporation including construction, planning and program management. In his various roles, Dr Nyanchama has developed policies, standards and guidelines for many organizations; he has served in a security operations role and performed audits in both in Government and private sector. His most recent engagement pertains to an assessment of one of the provincial Government in South Africa, an assignment that used the ISO27001 for gap assessment. He has designed and taught university courses in IT security, including in the Masters of Information Technology Security program of the University of Ontario Institute Of Technology (UOIT), Ontario, Canada. Dr Nyanchama holds Masters and Doctoral degrees in Computer Science and a Bsc in Electrical Engineering. He has presented on many subjects on information security and written about information security metrics. He has published a number of security management papers, including co-authoring a chapter in the Information Security Management Handbook (5ed), a key reference Guide for the CISSP exams. Wallace Pitt is a Project Director at Agano Consulting Inc., where he provides strategic Information Technology and business consulting services. He has over 15 years of Information Technology leadership experience; Wallace started his career as in IT business application support at the Toronto Hospital (now University Health Network) where he moved up the ranks to become a Data Center Operations Manager. Along the way, he developed a keen interest in the Information Security discipline, and was given responsibility for the IT Security management function for what became the largest hospital corporation in Canada. Toronto) where he consulted for with such as US-based clients as Citi Group, Cypress Semi-Conductor, Commerce One, and Thompson Corporation. In 2004 Wallace joined Symcor Inc. in the role of Director and Chief Information Security Officer (CISO), where he developed a complete enterprise security program, and acted as the company’s representative in all IT Security matters related to Canada’s 4 major banks. In this role, he consistently delivered on the successful completion (met or exceeded) security compliance objectives. As a Project Director with Agano Consulting Inc., Wallace brings a sound knowledge of IT Security and Electronic Service Delivery methods and best practices, along with significant project and program management experience. Dismas Ong’ondi (MBA, PGDip (Comp Sc. ), B.Ed. (Sc. ), CISSP, CISM, CISA) is a seasoned Information and Communication Technology (ICT) professional with nearly twenty years’ experience in Business Continuity Management. He has diverse experience in public/private sector organisations spanning the financial services, manufacturing, energy and elections management industries. He is an expert in Business Continuity Management and Information Security and Assurance/Audits. 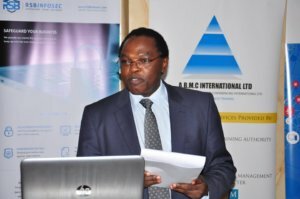 Dismas oversaw successful implementations of two fully converged IP networks: Kenya Pipeline, LAN/WAN comprising 20 remote sites and 800 users, valued at KES 60 million and the Independent Elections and Boundaries Commission (IEBC), 18 remote sites, 400 users, valued at more than US$1.3 million. He managed Large-scale Systems Implementation in the elections system of Kenya. Mr. Ong’ondi Established and maintained a fully operational and dedicated internal business continuity and disaster recovery site for Standard Chartered Bank, East and Southern Africa and conducted several successful cross-border business continuity and disaster recovery live tests. 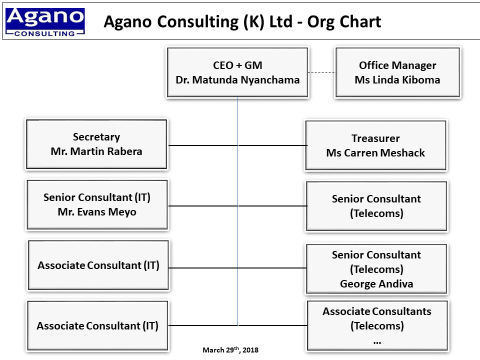 Evans Meyo is an associate consultant with Agano Consulting (K) Ltd. with focus on enterprise security, risk management, and identity and access management, among others. Evans has 7 years of experience in IT and software development, including the last 2 years in Information Security and identity management. Evans has worked as a senior consultant at ERISS where he covered identity and access management, security, and risk management, and a general portfolio encompassing systems analysis & design and IT project management. User support & antivirus management. IT operations: routine preventive maintenance, network administration, backup and database maintenance, user support, troubleshooting software and hardware, maintaining inventory and developing database and web applications. Oversaw the risk management and protection of corporate IT assets, and directed the implementation of the enterprise identity management and 2-factor authentication systems for the company’s clients. Evans is a Certified Information Systems Auditor (CISA), a Certified Information Security Manager (CISM), and a certified Project Management Professional (PMP). He holds an Msc degree (IT System Security & Audit) from Strathmore University and a Bsc Computer Science from Moi University in is a graduate of both Strathmore University and Moi University for MSC. He is a member of Information Systems and Audit Controls Association (ISACA), the Systems and Network Security (SANS) association, and the Project Management Institute (PMI). George Asiko is an experienced radio-communication engineer right from AM to FM to Digital Transmission. He has worked through the broadcasting evolution progression from AM to Digital Migration. George studies at the Technical University of Mombasa as a technologist in the media department and has designed radio/TV studios and FM radio station up to the implementation stage. He has participated in the formulation of the curriculum for the degree program in mass communication and trained students in practical radio and TV production. Presently, he trains in wide range of telecommunication systems and technologies, which includes radar, optic fiber, cellular and fixed phones, satellite links, radio and TV both analogue and digital, CCTV, Conference video etc. in the department of electrical and electronics engineering. In the recent past he has been involved in consulting for radio/tv stations for Mombasa and Kenya Polytechnics university colleges; community radio for the millennium village sponsored by the UN in Siaya County; and the Siaya County Government project for the establishment for a radio broadcasting unit. Hannington has over 20 years’ experience in telecommunications, including conception, design, installation, testing and commission of telecommunication systems. He has planned, designed and installed optical fibre links and structured cabling. He has designed and installed WANs and LANs and done block wiring in a number of projects. Mr. Ounga has in the past worked at the defunct Kenya Posts and Telecommunications Corporation (KPTC) and later Telkom Kenya, where he was extensively trained and gained substantial experience. Some key projects he has worked on before include the designing, planning and installation of Optic Fiber links between Milimani and IT department in Teleposta Towers, Mombasa TKL HQ and Telephone house among others; designing, planning and installation of TKL LANs and WAN. This includes structured cabling (SCS), Router and switch configuration in Telecares and Telkom Kenya Limited offices countrywide; installation of telecommunication Equipment likes Single Channel and multi-channel Radios, block wiring and the Mobile base stations (ETAX) while a technician; and general IT support, among many others. Paul holds advanced diploma in telecommunication engineering from Multi-Media University College, where he specialized in telecommunication engineering. He worked for Telkom Kenya ltd for twenty years, rising through the ranks to the level of manager telecommunication network planning in charge of access network design, planning and project implementation .He has vast experience in fiber optic design, management & maintenance. After voluntary retirement, he joined Damisha Building Contractors as a consultant in charge of optical cable network design and implementation.